How does SAP Connector work? Transport packages have to be installed on the SAP system. In addition, you need 1) technical user with the proper access rights; 2) Jedox Integrator to extract the relevant data out of SAP, including master data, either from ERP or BI; 3) predefined Kickstart packages for a quick start including ETL projects and report bundles. What are the effects of the integration on the SAP side? On SAP system: during data loading, one single RFC request is started in a work process. It only reads data; it does not modify data. There is no footprint after the RFC call, and no report is generated. Relevant SAP data is stored in an analytical way in the Jedox OLAP server and can therefore be used for planning purpose, such as planning workflows, viewing different versions, and state-of-the-art web/mobile reporting. Will users notice SAP slowing down during data loads? Not on the SAP side. In the SAP system, queries are raised in one single work process. This should not slow down SAP performance. When using SAP’s database, how is the ETL process built? 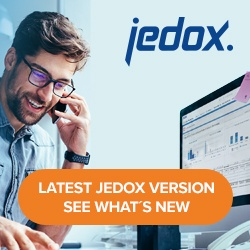 Jedox uses its own extract types within the Jedox SAP Connector to get SAP data easily loaded into Jedox. The possibility of transforming the data is also given in a very easy way, with no programming needed. Jedox extracts relevant data out of SAP, transforms and enriches this data, and loads it into a Jedox cube. The loads can be scheduled and used in different modes, e.g. full loads or incremental loads. How many rows, cells, tables, gigabytes? As many as needed. There is no limitation on the amount of data you can pull out of the SAP system. Does ETL transfer only incremental data, or does it extract new and historical data every time? Both options are possible. After loading all relevant data once, you can use incremental loads to reduce the job duration of data loads. How often is the ETL process run? Once per minute, hour, day…? ETL processes can be scheduled individually. For most projects, a daily run of the ETL process is sufficient. However, if needed, the job can be scheduled to run every few seconds, depends on the run time and amount of data you need to extract. What are the run times for the ETL process? Seconds, minutes, hours…? Benchmark for COEP: 1 million transactions take approximately 10 minutes. How is the authorization between the SAP database and Jedox handled? There is only one SAP user needed, with RFC authorizations for the data loading. What kind of experiences have Jedox customers had with SAP integration? Master data, including structure and attributes, can be loaded very quickly and easily. Extracting BW cubes at a high level of detail may be slow, in comparison to other databases. Logic, e.g. switching accounts, have to be defined in the project. Overall, we have had very good customer feedback. First statement is correct. So far, there was never a real performance issue as far as you do e.g. daily loading. Does Jedox have reference implementations where SAP’s operational database is used as the source for Jedox? Yes, many Jedox customers use the SAP connector to connect to their operational SAP system. Please have a look at the following success stories: SKF, Sanofi, Süddeutscherverlag, Zimmer, Clariant, Dystar, Dürr, Vivantes, Siemens.